The latest comics showing up on the Archie Comics Android app are SU#94 and StH#290. I've looked it up, and there are newer issues, so where are they? So I've heard that after the reboot happened, many characters were cut/killed off due to copyright issues with one of the writers. They all seem to be comic exclusives though, like Scourge or Fiona. Are there any of the older comic characters left, or do the newer comics just have the SEGA and SatAm cast? So I've been reading the Archie Sonic comics lately (currently finished issue 76), and to be honest, they just don't really interest me. I understand that it's basically a comic book version of Sonic SatAM with it's darker tone and drama, but I just can't really get into it (not saying it should be super wacky and filled with cringe-worthy puns like back when the comic first started, but still). However, I've seen bits and pieces from some of the newer comics (specifically the ones that take place after the reboot), and they seem more up my ally from what I've seen so far. They seem to be a perfect blend of comedy and action, and I appreciate the little references to the SEGA games. I'm intrigued to quit reading the older comics and begin reading the new ones, but at the same time I wanna see how things unfold in the Sonic-verse. So I don't know, should I keep reading, or no? I've seen that this very obscure comic is not on the site even though it's somewhat of a sabrina and Sonic the hedgehog crossover. I have scans to that short comic so, anyone object in posting that in the Specials section or something? I wouldn't mind if it was either of the two. I don't really like GUN as they just seem to have a vibe of begin the bad guy. Let's also not forget all the cars there big dumb truck destroyed in Sonic Adventure 2. I know that the comic ending is a negative topic, but let's turn it some what positive. How would you like the comic to end? I want it to end with one big showdown and then somewhat a happy ending, like everything is at peace or is going to be very peaceful from this point on. Been a while since I've made a topic. Now hold it, I know this looks like a shipping post though I do ship these two it's not. All's I want to know is do you guys want to see tails have an adventure with Sonar or story arch with Sonar the green fox? I think it would be neat and interesting. 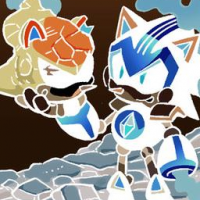 I kind of want Sonar to be like this one new character from STC-O where she's in love with tails, but at the same time I just want to see Tails or the freedom fighter members interact with the group Sonar's in and eventually confront them when they find out there also working for eggman. though i'd ask this question, and apologize if it's in the wrong place but, what do you guys do to kill time or keep you're mind distracted while waiting for the next archie sonic comic? I try to do things like read other comics or keep myself busy with other things. What do you guys do? This question is probably going to get under the skin of mods and others on here, but I have to ask it. If Archie basically loses the license to do Sonic comics, do you believe that it will go on unofficially like with sonic the comic? For me, I think the answer is obvious. Archie's Sonic series has just as big, if not bigger following as Sonic The Comic, and I can see if not Ian Flynn, fans doing what there doing now with lost hedgehog tales, banding together to make it happen or go on. I wouldn't mind this either cause as you know, and as mods have pointed out I'm one of those people who doesn't really let go of the old world, but if the comic goes on unofficially, whoever is in charge can do whatever they want, bringing back certain characters included. Sorry if this seems negative but I had to ask, and to be fair this seems very possible if the series were ever to die, given the small but still large fan base for it. What are your thoughts guys? Would this seem very likely to happen if the comics go? Comment below your thoughts. what do you guys think archie comics will do for sonic's 25th anniversary? Other then a special comic or issue, i don't really know if there gonna do anything other then that celebration wise. so as we all know, conquoring storm is coming back to the comics (praise the lord). After the eggman arch, what would do you think she'll be doing or when do you think we'll see her again? i personally hope it's soon, and she's turned into a bit of an anti-hero. what do you guys think? so just out of curiosity here, what do you guys think of Ian flynn as a writer? I like his writing but dispute what dylan says i still feel like somethings missing from it in the today comics. i also don't like reports of what he can and can't do with no if's and's or but's, but that's a whole other conversation. the same ken panders who's sending out wired tweets told me something intresting today. there was going to be a movie based on what he did on the comics. he had the backing of a producer of the animated x men series, and the project was meant for 2011. this sadly didn't come to be as one of the supporting people passed away. what do you guys think of all of this? what's your say in this guys. so ships in the series can no longer happen due to archie fearing sega will take the license away from them (the comic book is more closer to the series.) if this situation ever blows over or ends, do you think we'll see couples in the series again? now I know what you guys are thinking, team random come on now, panders won, you should know this by now. Well, panders said he doesn't have Fiona fox's rights. I know other writers characters have been taken out, but would it kill Archie to maybe ask the writers permission to use there characters or reintroduce Fiona? have pages that are either incomplete, or "corrupted" with black boxes that shouldn't be there. When time permits, the admins really should correct these errors by re-uploading the original image files. Pages that need fixing are 12, 13, 14 and 15 of Sonic the Hedgehog #5.
teamradnom21 (me): hey guys! glad you could make it. knuckles: so what's this meeting all about? teamrandom21: well, i want you all to be a part of something...a fan fiction series. scourage: horrible! terrible! madness! like a bad fever dream acid trip. teamrandom21: look guys i know this is bad but come on now, i'm tired of the comics begin ruined because panders wants lara-su to be in some comic (or manga as i call it just to clown honk panders off) that looks like a very bad fever dream after reading all the knuckles comics. no offense knuckles. teamrandom21: that and come on guys, don't you want to work with each other again, all of you. scourage: well i do want to live up to my promise of "big plans" for sonic's world. teamrandom21: exactly! come on guys, so what if this is fan fiction? i'm tired of the comics and other great things suffering either cause sega goofed up or panders wants to pull a lawsuit card. all's i ask is for you people to be a part of this fan fiction series for the fans, by the fans! scourage: and panders can't sue us cause it's just fan fiction, and we're not making any money off it. teamrandom21: yes! (sadly) but yes, now come on, let's do this! are you ready? teamrandom21: then let's do this! for the fans! alright guys, i've talked about sad and dissapointing, now let's add some positivity to the mix. what are do you think are some of the most cute and touching moments in the sonic comic's? what funny off panel strips do you want to see in the future. i know it's 99.9 precent impossible but i want there to be one where tails is taking a picture/selfies with the distructic's or all the ken panders characters and ian flynn or sonic come up to him and say "what's the meaning of this!?!" and tails just shrugs saying "what? i know i'm not the only one missing them..."
I bet Flynn got that one thousands of times. "Will Honey show up in comics?". I bet everybody would support. So the real question isn't the one fans ask, but the one Flynn must ask himself. Or rather questions. If Bean and Bark are bad guys, should Honey be too? Should she be a mercenary? What can she add to comics? What she would be like? What would be her powers? Of course since Honey is based on character from Fighting Vipers (who was renamed Candy in USA), Honey could simply be exactly the same, but some may consider that approach lazy and "fashionista that joined tournament to promote her line of clothing" probably wouldn't translate correctly. Personally I wouldn't mind if she was a bad, since we kind lost all female villains, but I'm open to interpretation. Candy is "Cute and sweet to be around; usually shy and quiet, but wild and wicked as a Viper" and I guess that this personality just as well as any other. Her abilities are slightly generic: Candy is simply a martial artist, and Honey due to being unfinished has only moves of other characters, mostly Knuckles. Besides fighting skill I considered ability to change size of her hands like characters in Sonic Fighters did but that would be a little weird. One webcomic had a brilliant idea thought: Honey could copy moves of her opponents (get it, she was a "copycat") . See this is why comic book writers can't read fanfiction - Flynn only could use that idea if he came up with it himself. The biggest question is probably how to insert her into comic. In case she couldn't become a full character I had an idea: make her new Bivalve. She could show up in background of the comic whenever action would take place in Mobotropolis, and through those short appearances we could learn more about her. She could be fighting a Eggswat next time Eggman attacks, or show Cream some fighting moves to defend herself. With cleaver planning her appearances could even have some narrative to it. Hey, new here so sorry if there's something wrong with my post, but I was wondering what was up with Archie Sonic the hedgehog issue 257? Is the site not gonna upload it, or has it not yet been published? Just wonderin cus it's almost two weeks into the month and it usually pops up around the 4th -7th.